"...Knock, knock, went the wicked wolf; the door opened wide. But it wasn't Grandmother, it was Buzz Aldrin, American's Number 2 spaceman. For this wasn't Granny's house, but the headquarters of NASA, the American space research agency. The wicked wolf was shot by security guards and the American space program went on, unmolested by wolves and other forest animals intent on damaging American prestige." When I first heard of the Monty Python: Live! box from A&E, I assumed it would be a collection of clips from various live performances throughout their career. Little did I know that the set would actually contain some full-length programs (like Live At The Hollywood Bowl), as well as a special supplements like a commentary by the inventor of the can opener (in the context of Monty Python's effect on the world of canned goods), a documentary on the history of sponges through the ages, and guidelines for making your own clothes out of those discarded, plastic rings around milk jug caps. OK, so it doesn't really have those supplements, but let's pretend it does. Assuming you're completely clueless as to who/what Monty Python is (you Philistine), Monty Python's Flying Circus was a BBC comedy program in which John Cleese, Michael Palin, Graham Chapman, Terry Jones, Terry Gilliam, and Eric Idle (not necessarily in that order) performed bizarre skits, spoofs, and general wackiness to a confused British public. A&E has already given us the entire television series on DVD, now they move on to more miscellaneous things in this set. The first presentation is the original film Monty Python: Live At The Hollywood Bowl, which came out theatrically in 1982. Obviously, it's a Monty Python concert filmed at the Hollywood Bowl, one of their few American performances. While it contains the Python boys doing several of their classic bits, there is a healthy dose of new material, such as the Philosopher's Drinking Song and the History of Slapstick. The live audience interacts a bit, and it's all generally unhealthy fun. Python regulars like Carol Cleveland and musician Neil Innes make appearances as well, adding to the connections between the original television program and this work. Amazingly, the Pythons manage to impress on many levels with their superb timing and ability to deliver solid versions of their classic sketches as if it was not spontaneous and live. Considering that at one time they thought they'd never be successful in the U.S., the fanaticism of the folks at this performance must have surprised them a bit. 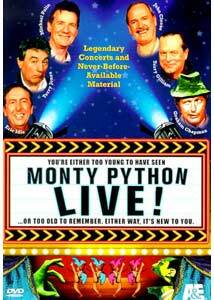 Next we have the Monty Python tribute that was performed at the 1998 Aspen Comedy Festival. What made this such a big deal for most people, was that it was an onstage reunion of all the Python chaps (including the ex-Graham Chapman, in his special guest urn). Although they'd teamed up through the years on various projects, they'd never done anything on camera together since the last Python movie (unless you count the 20 Years of Python special, which I don't, for reasons explained later). In true Python form, nothing is very serious, and it's more of a big comedy routine than anything else. The show is hosted by Robert Klein who, thankfully, does not try to "act" Python or upstage them. Preceding the actual on-stage antics is a collage of various clips from the MPFC series. Eric Idle sings Always Look on the Bright Side of Life, comedian Eddie Izzard makes a very short appearance, and audience members like Ted Danson all get warm fuzzies from the privilege of having soaked up as many seats as possible with celebrity friends and family, leaving the real loony fans (you know, the ones dressed up like the Gumbys and lumberjacks) to freeze outside. Starting disc #2 is Parrot Sketch Not Included: 20 Years of Python, the 1989, A&E television special that, for the most part, many Python fans would like to forget. It's basically a lengthy compilation of some of the more memorable sketches and comedy routines from the show, excluding the famous Parrot Sketch, which is generally considered overdone and over-requested. I suppose this alone wouldn't make it too bad, but unfortunately host Steve Martin thinks he's perfect material to replace the humor of the Python boys, and so he "does" Python for the entire show. Bad idea. He's not funny trying to mimic the MPFC style and the big Python reunion that got the show a great deal of press at the time wound up to be a 5 second cameo that, although cute, wasn't worth sitting through an hour or so of Steve Martin. The DVD contains a special, shiny, bonus of epic proportions: The first of Monty Python's two German episodes, designed for German television (where it was called Monty Python's Fliegender Zirkus). The Pythons filmed the episode in rehearsed German dialogue and then again in English (for broadcast at home). Unfortunately, the English version was lost, so the German version is presented, but it doesn't really matter since it's subtitled. Many of their classic skits are resurrected for first-time viewers, but most of the material is original and is very funny, especially the Bavarian Restaurant Sketch and the twisted version of Little Red Riding Hood. I think the second German episode (found in the Life Of Python box) is better and more refined, but this is still a great bit of humor. Perhaps the most unintentionally funny part of the episode is how the Lumberjack Song comes off in German. Monty Python fans have it darn good on DVD, especially since this box pretty much fills in all the gaps as far as their TV and stage work goes. If there's anything really bad about this set of goodies, it's the fact that the Live In Aspen show is a bit clouded by the minor controversy over John Cleese publicly announcing that the troupe was working on a special project for their 30th anniversary when, in fact, there really weren't any plans in progress. So, for those of you wondering what happened, I gather from interviews from people like Terry Gilliam and Michael Palin that the group was a bit miffed at being pressured into something, especially since they were all busy with their own work. I have no doubt there may be something up their collective sleeves, but it probably won't materialize for some time. Although it doesn't have much to do with Monty Python, I think now would be a good time for A&E to put out all of Michael Palin's superb travelogue films like Full Circle and Pole To Pole, among others. For a long time, it seemed the ground-breaking work of these guys was pushed to the side and never taken seriously. I can't believe it took so long for their 'cult' status to really reach through into the well-deserved realm of respect and admiration. They revolutionized television comedy, and certainly broke so many rules that their influence is just as significant as an Orson Welles or Alfred Hitchcock in entertainment. Their fans now, as well, are treated like real people instead of some kind of fringe group; heck, I know people who have studied Python in film classes. So, now we can all enjoy "Tony M. Nyphot's Flying Riscu" as if it were as grand as Shakespeare's "Thamel." Er...Hamlet. Image Transfer Review: While the image quality on Live In Aspen and 20 Years of Python is decent and up to reasonably modern standards, the other two programs don't fare as well. Live At The Hollywood Bowl is extremely grainy, blurry, and worst of all, not properly widescreened to its 1:85:1 aspect ratio, resulting in bad cropping and some text that goes off the screen. It looks like pooh, really, but I won't complain too harshly because I seriously doubt this could have been avoided, given the low quality of all previous releases. It can still be enjoyed, it's just not anything special. The German episode is in amazingly bad condition, worse than my old VHS copy, taped off cable. Not so much in terms of transfer, but the source is in very poor shape, compared to previous versions I've seen. There's extreme print damage, excessive fading, and there are many scenes in which numerous dark lines go down the middle of the frame. Again, this won't have any effect on the die-hard Python fan, but videophiles will certainly want to turn off any and all examination of the image. Digitally, though, there are no signs of problems, so I guess that's a plus as the poor condition of these shows could have easily been a disaster of pixelization and horrendous artifacts. Audio Transfer Review: Everything is in mono with the exception of the Aspen Festival, which is in stereo. The sound is acceptable, but given the age and quality of the sources, it's nothing great. Hollywood Bowl is pretty harsh and has to be turned up fairly loud to make everything clearly audible and intelligible. Everything else is generally of the same, basic quality. Extras Review: Like previous entries in the Monty Python series of DVDs, there are a few minor extras in the "Looney Bin" section on each disc, most of which are simply clips from the television show, edited together in uncomfortable ways. A small dictionary of 'Pythonisms' is on the first disc, and the second contains project listings for each of the Python lads since their days with the troupe. These indices are rather abridged however, and don't really cover all their work. The menus and general functionality are identical to the regular Python discs. Monty Python: Live! is a no-brainer for Python fans, and you know who you are. Otherwise, it's more of a curiosity. If you want to see Hollywood Bowl, just rent the original VHS, since there's no significant upgrade in quality or features here. Besides, this new box set has 25% more less, and is absolutely indistinguishable from a dead crab.